Starting today, you can check out digital Kindle books from your local library branch (well, one that’s hip to digital downloads, anyway) and read them on your Kindle device, your desktop, or any smartphone or tablet that supports Amazon’s free Kindle app. Pretty nice, and yes, it’s free—although you will need a library card, plus a little patience in case the Kindle book you want is already checked out. Here’s how to get started. First, you’ll need an Amazon account; if you don’t already have one, just visit the site to get started. And remember, you don’t need an actual Kindle device to read a Kindle book; as long as you have a PC, a Mac, or a smartphone, you’re all set. Next, find a local library that supports Kindle book lending. 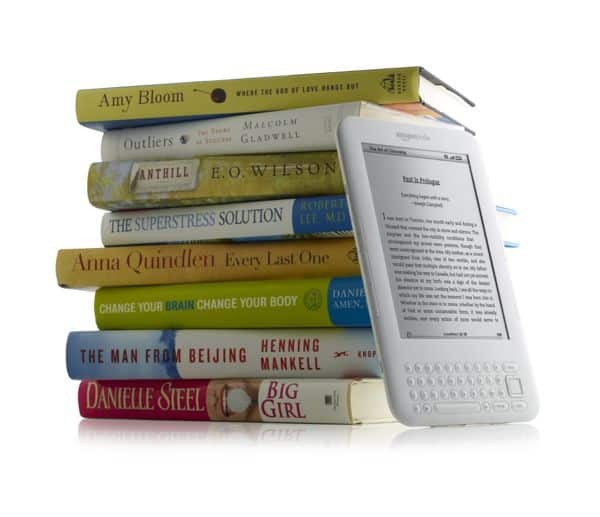 (More than 11,000 branches are lending Kindle volumes as of Wednesday, Amazon says.) If you happen to know the Internet address for your local branch, go ahead and visit its website, then look for a link that reads “Downloadable Media” (or something similar). Or, here’s an easier way: just click this link, then enter your ZIP code, your city, or the name of your local library into the search form. So, did you arrive at the electronic stacks of your local branch? Good. Now, it’s time to log in with your library card. Just click the “Login” button in the top-right corner of the page, then enter your library card number and personal identification number (or PIN). Don’t know your PIN? Then contact your librarian for help. OK, time to find some Kindle books to borrow! Start looking by using the search using the form at the top of the page. Don’t forget to select “Kindle Book” from the pull-down menu; you can also take advantage the “Only show titles with copies available” checkbox, given that your library will only have a limited number of digital Kindle “copies” of a given title on hand. Once you’ve found some Kindle books to borrow, just add them to your online e-cart, then click the “Checkout” button when you’re ready to download your books. All set? Click the “Get for Kindle” link, and your browser will automatically jump to Amazon’s website. From there, you can specify which your of devices you’d like your Kindle book sent to—your Kindle reader, your smartphone, your iPad, or the Kindle “Cloud Reader” website. Once you’ve finished checking out your book, it will be delivered to the device you picked via Wi-Fi—or if you don’t have wireless at home, you can use a wired USB connection. Just like a regular library book, the Kindle book you lent from the library will eventually expire. You’ll get an e-mail messaging warning you three days before the loan period ends (the length of the loan will vary depending on the book you checked out), and you’ll get a second message once the book expires and gets wiped off your device. That’s it! Also, one more thing: Amazon will keep track of any bookmarks or notes you made in your loaner Kindle book, and will restore them all in case you eventually decide to buy the book for yourself. Looking for more Kindle tips, news, and how-tos? Click here!